A few months ago, I started working on a companion Chrome (and Opera) extension for APKMirror. 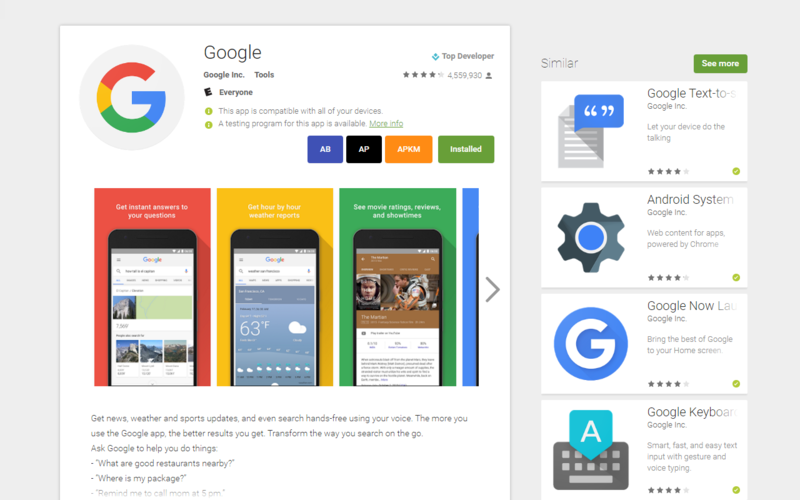 The extension simply added a button next to the Install button on the Google Play Store, which searched the application on APKMirror (thus allowing you to easily download APKs). But over the course of development, the extension gained more and more abilities that should be in the Play Store already. Today, I am excited to finally release Toolbox for Google Play Store. Toolbox consists of several features, which can all be turned on or off individually in the extension settings. Firstly, the extension integrates APKMirror, Android Police, and Appbrain into Play Store app listings. Each site has a button next to the Install button. The APKMirror button searches for APKs of the application, the Android Police button searches for posts about the app, and the Appbrain button shows statistics about the given application. Next up is my favorite feature, which shows testing program information directly on app listings. When this feature is on, Toolbox checks if a given application has a beta/testing program available. It then tells you if you are signed up for it or not, and provides the link to do so. Finally, you might have noticed the annoying bug where '&' symbols show up as '&amp;' when you select the device for app installation. For example, my AT&T Nexus 5X shows up as "AT&amp;T Nexus 5X." 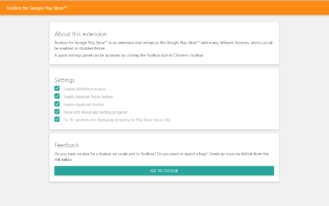 Toolbox fixes this bug, and frankly, I'm amazed Google hasn't fixed it by now. Clicking on the Toolbox icon in the toolbar reveals the quick settings, where every feature can be enabled or disabled without opening the full settings page. 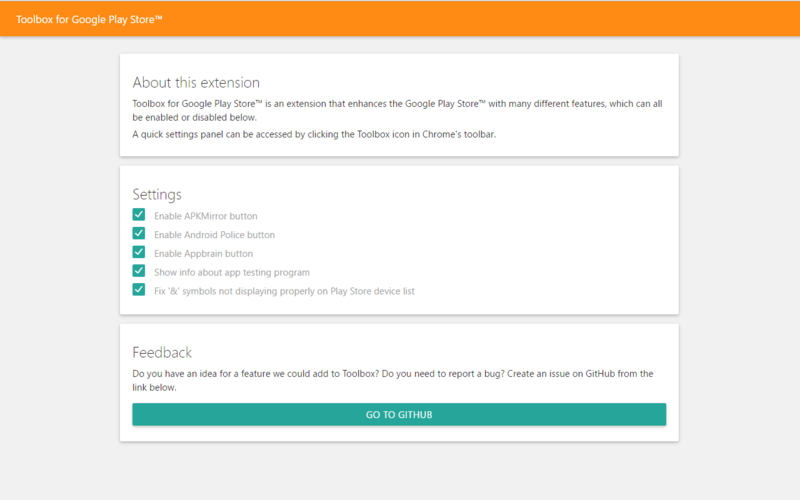 Toolbox for Google Play Store is currently available for Google Chrome, but a release for Opera should be ready within a few days (a Firefox version is coming soon™ ). If you have any feature suggestions (or bug reports), don't hesitate to leave them in the comments or at the GitHub issue tracker.